Roger Moore appeared in seven James Bond movies. This story first appeared in the Globe’s It’s All Downhill newsletter. Sign up to receive it by email here. The skier I am is a middle-aged dad who likes to cruise at a pretty good clip and generally skis first chair to last. The skier I always wanted to be is James Bond. I can hear the snickering now – a guy who wishes he were James Bond, who would’ve thunk it? But in this case it’s not just any Bond, it’s specifically the James Bond played by Roger Moore, who was the skiing James Bond. Sure, there were ski scenes in other Bond movies, but nobody did it better than Moore. And sure, Moore’s actual skiing in those scenes was probably limited to just a few push-offs and stops, but he was nonetheless the face of Bond for the most movies with ski scenes, and in at least two cases they are often considered among the best. Moore, who died this week at age 89, had three ski scenes – “The Spy Who Loved Me,” “For Your Eyes Only,” and “A View to a Kill” (which also features a snowboarding Bond). George Lazenby had one in “On Her Majesty’s Secret Service” that is often ranked the best. Pierce Brosnan had one in “The World is Not Enough” in which the epic landscape is rivaled only by Brosnan’s epic hair, shades, and ski suit. Timothy Dalton kinda sorta had one in “The Living Daylights” although it’s really more like Bond eluding some skiing bad guys in a sled made from a cello case. With Moore, however, skiing truly became a regular event in Bond movies, as easily accepted as gadgets, girls, and guns. Lazenby’s was the first Bond ski scene, but then came Moore’s three, and he set the bar. ■ Of course he brought a backpack with a parachute inside for his dramatic escape because who wouldn’t? ■ Has anyone ever looked better in a yellow one-piece snowsuit? ■ He skis backward to fire his ski pole rifle, then does a flip/twist off a ledge to get back on track and take out another bad guy. ■ He skis down a bobsled track. Savage. ■ He’s game for launching off a ski jump – the real, Olympic kind – using a pair of regular downhill skis, and savvy enough to take out a pair of bad guys immediately upon landing. ■ He has the vision to lodge a pole between two trees to clothesline a pursuer on a motorcycle. ■ He rejects the advances of the young and pretty Bibi Dahl in favor of hitting the slopes. Ski Scene - For Your Eyes Only from skirace coach on Vimeo. ■ He not only transitions seamlessly from skiing to snowboarding, but he also skims a pond and does a backside mute grab 180 (or something like that) to take out a villain. ■ He skis fast enough to catch an enemy on a snowmobile. It makes sense that Moore’s Bond would do what he did on skis because Moore sold it so well. He made Bond seem at ease in the mountains, probably at least partly due to Moore’s own affection for the sport. He gave Bond slope style, daring bravado, and athletic credibility. 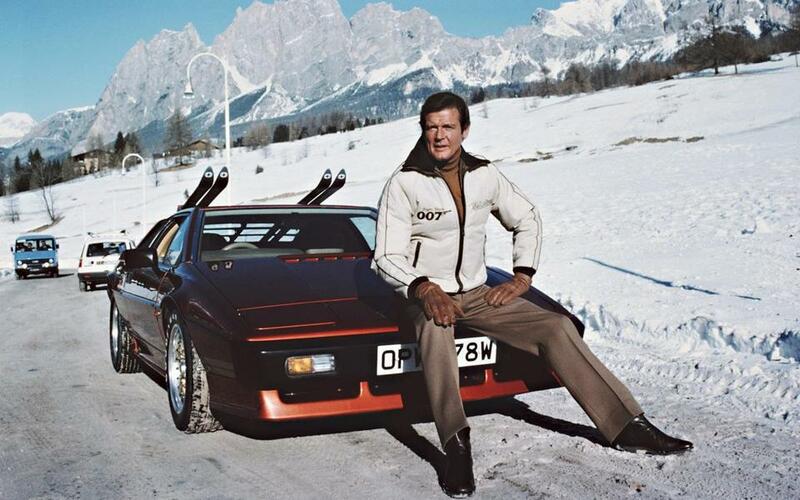 He made Bond a skier.